The cover image is taken at Södertull in Malmö, Sweden on one of the many bridges across the canals. In this case I wanted to capture some of the colorfulness of the signs as well as some of the hustle and bustle of people out and about. This was taken pretty early in the evening, so even though it is dark it isn’t really that late. I like how the phone camera managed to capture the scene pretty much how my eyes saw it. Unlike in the cover image I’d say the phone camera was not able to capture the scene here, but I still like how the blurry car going through the intersection seems very speedy (can’t remember if it was THAT fast), because it gives an impression of something seen all the time. I guess it’s an image that shows how a picture doesn’t have to be razor sharp to portray something. The Central Station in Malmö, Sweden is often a very busy place, at rush hour etc a lot busier than in this picture. I think if it had been I wouldn’t have seen this little girl pulling her own suitcase, but I am glad I did, because she seemed so very eager to go on a journey with the rest of her family. There’s just something about a train station that attracts me as a photographer - perhaps it is the way people are passing through my field of view, going or coming somewhere, all the emotions when people meet up for the first time in however long they’ve been apart. It can be a good spot for photography for sure…if you don’t get yelled at by security staff of course (which is why I try to stick with cell phone photography in there…and not my big analog or digital SLRs!). This image was taken at Barsebäckshamn harbor with the express purpose of turning it into a grainy black and white shot. I saw this bench as I took a seat across from it during a little photowalk in the harbor and was intrigued by the curves of the slats and the armrest, along with all the wear and tear on the bench and wanted to turn it into the black and white shot you see here. The fact that there are still chairs and a table on the sidewalk perhaps belies the title of the image, but it definitely felt like the season for an outside coffee break was over! November is definitely not a fun month for photography around here. It gets dark earlier and earlier, most of the fall colors are over and the Christmas lights and decorations aren’t up yet. So, it’s often a struggle to shoot during that month and you have to use whatever light you can find, like I did in this picture. This was taken very early on my birthday and although it was pretty cold I must say I like the way the ice crystals are formed on the glass walls of the bus stop. Soon after I took this picture it got warm enough (i.e. just above freezing) for these nature’s art works to disappear, so it was a good thing I had my eyes peeled for stuff to shoot! The final 31 days of the year went by in a mixed bag of gray and dreary weather, and we even got a small smattering of snow which, true to the way of things around here, disappeared within a few days…much to the dismay of kids with sleds and skis at the ready! The cover image is taken at the Skrylle recreational area outside Lund, Sweden, a place I’ve been to many a times through the years. This fir tree stood right next to the jogging path and told people that yes indeed it is Christmas season now. It only missed the light to be ready to have people dancing around it (not that I’d recommend it given how uneven the terrain is around it!). Day 343 - December 9: Is that enough light? 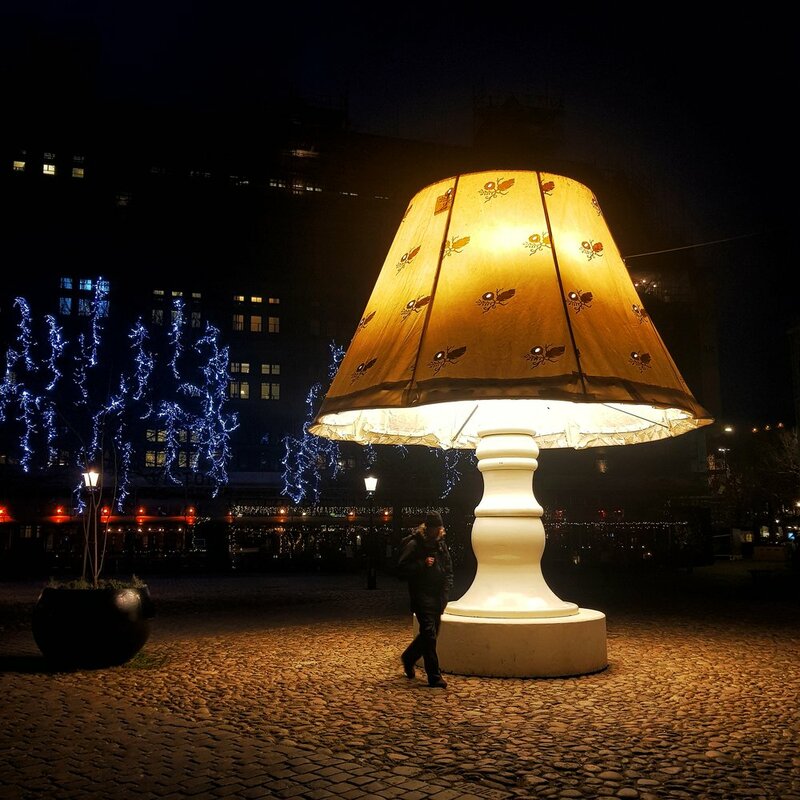 The city of Malmö has a few traditions when it comes to public Christmas decorations, and this just slightly oversized table lamp is one of them, although it tends to be placed in different areas of the city during the holidays. It seems to always bring a smile to people’s faces when they see it for the first time (and even for a few of who’ve seen it lots of times). I like how the artist (whose name eludes me) plays with scales and makes an ordinarily small object oversized. Day 357 - December 23: ...and now we have a white Christmas! The weather forecasters said that it wasn’t going to be the slightest chance of a white Christmas around these parts, so when I looked out the window on December 23rd and saw all the white stuff I was more than a bit surprised (as no doubt the weather people were…and hopefully a bit embarrassed). I found this single red rose that hadn’t lost its petals yet and thought it looked rather pretty against all the white and frozen. It seems to have become a tradition in Malmö for the still unknown art collective known as Anonymouse to put these tiny, but extremely detailed art installations into the urban landscape. I wasn’t sure if this year’s edition would still be around as it had been out there for well over a week by the time I got around to seeing it, but it was very much intact still. I do like the attention to details that this gang of people have, including even a little sign on the door of the barbershop on the right as to which credit cards the prospective clients are able to use! I hope they continue with their art pieces, because they always bring a smile to the faces of the people who crouch down to take in all the details. Day 365 - December 31: So long 2018! 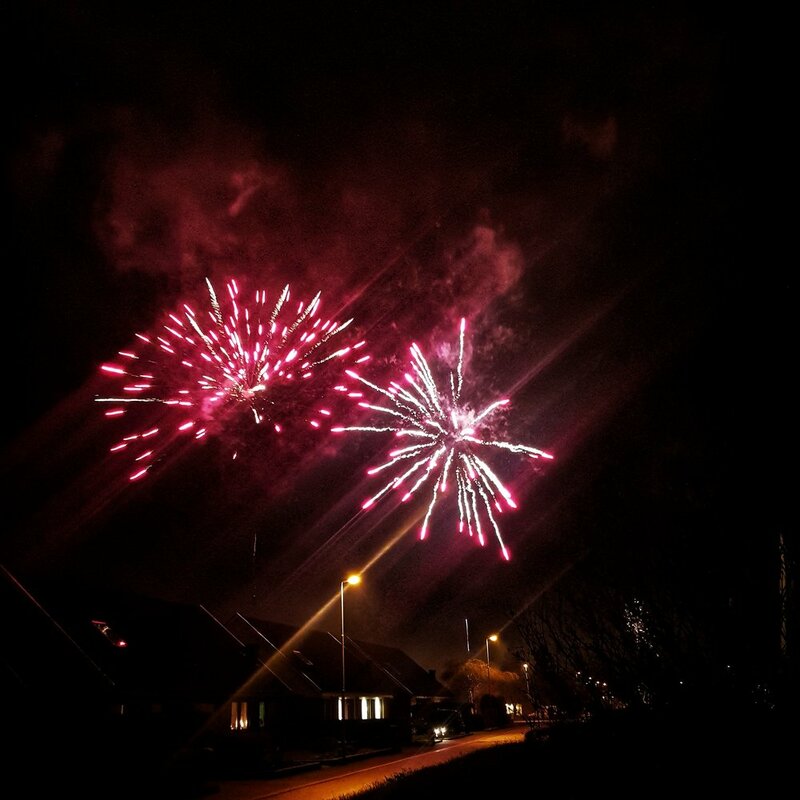 Hello 2019! The first day of 2019 is here as I write these words and it’s time to think of what’s in store for 2019? What should be my long-term project (because a project is a very good thing to have going)? I have come to the conclusion that I am not quite finished with this whole 365 idea. It doesn’t feel as done as it felt in 2016, so I think I am going to try to continue…to carry on with another 365 photo project during 2019, in the “proper” way like I started it back in January, uploading the image daily (or as close to it) to Instagram so that I can be held “accountable”. Will I finish it? Who knows? But for as long as I feel like I can do it…I will continue!